In 2004, Sharp introduced a world-first*2 oven with a completely new cooking appliance concept of "cooking with water" - using superheated steam. Ever since, for the past 12 years Sharp has introduced a variety of home appliances from a health-conscious viewpoint, such as the tea maker and electrical anhydrous pot system. 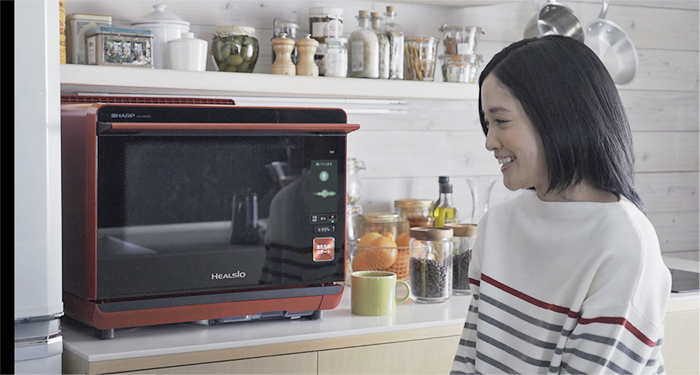 By connecting home appliances to the internet utilizing IoT and combining AI, the superheated steam oven has evolved into a more people-oriented product. 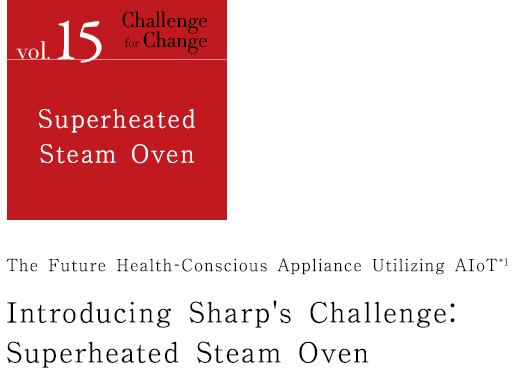 Here we introduce the challenges at Sharp upon developing and evolving the superheated steam oven. *1 AIoT is a fusion of AI (artificial intelligence) and IoT; a new concept of Sharp, aiming to create more people-oriented appliances by connecting appliances and IT products to cloud and implement AI. *2 Based on Sharp survey. The world's first home-use cooking appliance with superheated steam was introduced in September 2004. Efficiency and easiness used to be top priority in lifestyle, but this trend started to change from around year 2000 as people started to become more health- and environment- conscious. 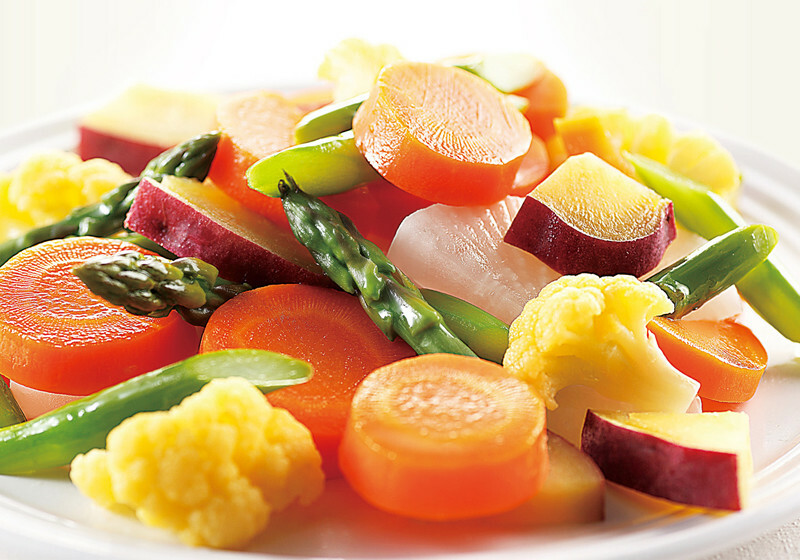 Sharp has been taking on a new approach toward health from the aspect of eating, and focused on a new cooking method using superheated steam. There are many features cooking with superheated steam compared with conventional convection oven, such as preserving more vitamin (nutrition), cutting oil, and reducing salt. Although superheated steam was already applied in professional kitchens, it was not an easy task to bring this technology into regular households. This is where the challenges at Sharp started - to develop the superheated steam oven to realize healthy cooking. At the start of developing superheated steam technology for home-use, Sharp consulted with the Osaka Prefecture University, who Sharp had contacts with from before. Osaka Prefecture University was also researching superheated steam at that time for appliance to environmental recycling, and a joint research started. First, fundamental experiments were conducted utilizing superheated steam technology with 200V professional setting, and many findings were made through verifications. By cooking with superheated steam, there were less loss of nutrition compared with microwave oven cooking using magnetron, and the taste of the foodstuff stood out. 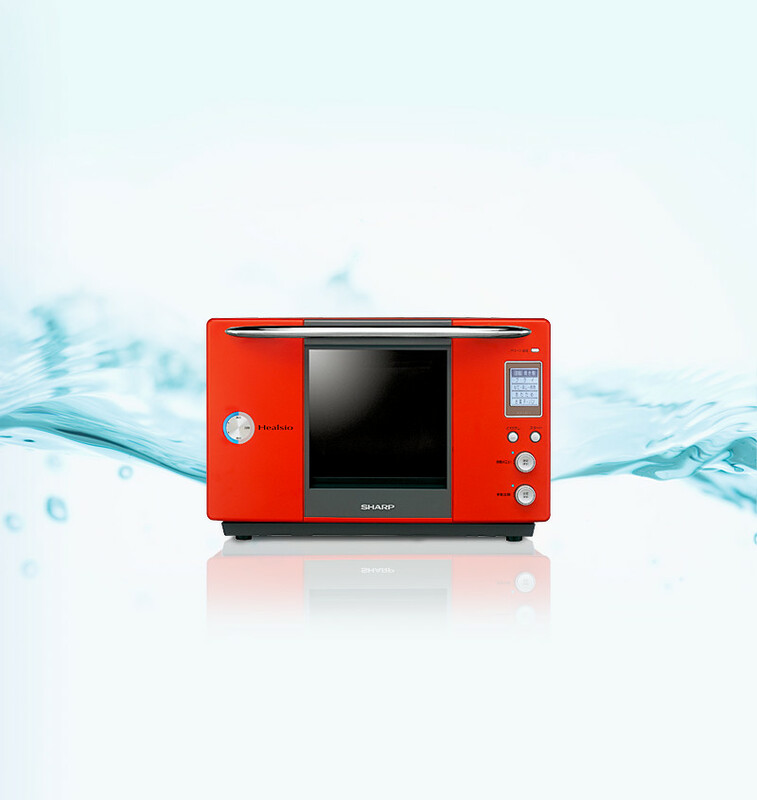 The significance of developing appliances that realize easy cooking of health-conscious and tasty meals at home was reconfirmed at this point, and Sharp set up a "Water Oven" project to start development. Cooking with superheated steam was already realized in professional kitchens, but this required large scale facilities such as food processing plants. How could this be made more compact to fit in the regular household kitchen size, and how can steam be generated more efficiently under the low 100V voltage in Japanese households compared with 200V in professional use? It was concluded that by generating a large mass of highly heated steam, the oxygen inside the oven can be driven out to create an environment of low-oxygen cooking that enables to save more nutrition. First, in order to generate 300 degrees Celsius steam, a steam accelerating unit installing 4 heaters was developed. While struggling to control the output of each heater in order not to exceed 100V, generating large mass of superheated steam was finally realized. At the same time, oil-cut effect from food was also confirmed, together with salt reduction observed through further development and experiments. The next challenge was how to increase steam inside the oven and apply heat to the food efficiently. First, a stainless plate strong against rust was used to form the internal part of the oven, as large mass of steam would be generated. Also, a unique high-sealing door shield that would not open even with the steam pressure was developed. These efforts lead to the creation of "Water Heat Technology" realizing cooking under low-oxygen environment of less than 1% inside the oven. Furthermore, in order to realize a size close to microwave ovens (26 liters type), the steam accelerating unit was improved to a smaller model while generating more power, realizing larger space inside the oven (30 liters type introduced to Japanese market in December 2016). Being a completely new product, many of the knowledge accumulated through developing microwave ovens did not work out, and developing cooking menus also started from scratch. Each menu was tested and verified to be added to a COOK BOOK included in the first superheated steam oven introduced in 2004. 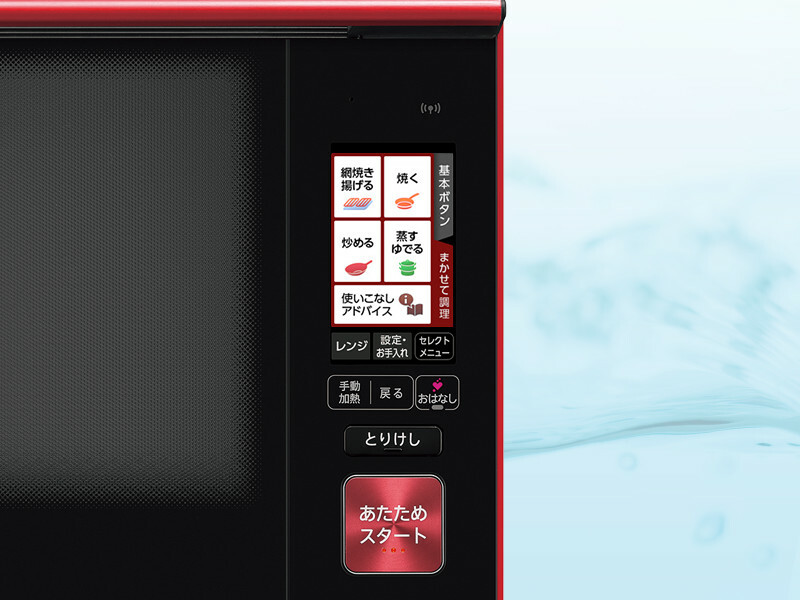 Also from the second generation model, a microwave oven function was added after hearing customers' needs. However, after investigating customers' actual usage of the product over the following years, it was discovered that the added microwave function was used as the main function in many households. Users were concerned on how strictly they needed to follow the COOK BOOK when they did not have or were short of the foodstuff described, or could not make the preparations as described, such as unfreezing meat. In such cases, they returned to their familiar fry pans to cook their meals. Sharp's desire was to have this oven accepted to realize easy and healthy cooking. This lead to the development of a smart cooking function that enables various cooking of baking, steaming, stir frying and deep frying regardless of the amount of the foodstuff amount and its status - whether it is frozen, chilled or regular temperature. In order to realize this function, an infrared sensor to recognize the temperature and amount of foodstuff used in microwave ovens was inevitable. However, initially this could not be installed since the steam inside the oven clouded the sensor. Later developed was an infrared moving sensor, which measures the foodstuff first, and then rotates to face outside of the oven space while maintaining the seal. By combining this technology with the superheated steam technology, stress-free, easy-to-do and healthy cooking was realized. The initial models needed more time to generate superheated steam, leading to longer cooking time, but by making the engines higher in efficiency, the cooking time was reduced. In the recently introduced 30 liter model, 100 speedy baking and steaming menus are preinstalled, and the latest AX-XW300 model introduced from September 2016 in Japan enables cooking side dishes in the upper rack while cooking rice in the lower rack simultaneously, realizing cooking several menus more efficiently. Furthermore, there is a function to prepare dried foods condensed with nutrition and tastiness leaving it up to the oven in spare time. The superheated steam oven has evolved in many ways, but the largest issue people face had not been resolved - thinking of daily menus. This is why Sharp evolved the product to install AIoT, connecting to IoT and giving AI, making it a cooking partner. "COCORO KITCHEN" (requires wireless broadband connection to the internet) is a function to connect the product to cloud servers via internet to increase usability for customers. Not only useful for adding new recipes, customers can literally talk and consult with the product about preferred cooking time, calories settings, available foodstuff and such, and the product will make suggestions based on previous cooking records, seasons, and weather etc. The AI function then automatically educates the product to learn the family's favorites. At first, the product could only respond in certain phrases, but by adopting algorithms specialized to cooking, and evolving the analysis program to better understand what was said, the product became able to reply more smoothly to the customers’ questions. Sometimes it even gives playful replies, like responding to a customer’s proposal "will you marry me?” and such. Sharp views future home appliances will not only serve as useful tools to help household tasks, but will evolve together with customers to become their partners. In addition to the above, Sharp also carried out joint development with Fundely Co. Ltd., a company specialized in dietary healthcare with many dieticians enrolled, to install menus for ailment such as diabetes to the product to support the patients and their families. Sharp will continue to take on challenges to become an iconic global brand.